Learn about the people behind Ardiel Septic Services. All About Ardiel Septic Services! At Ardiel Septic Services we are going to show you how to protect your land, your water and your investment. We provide complete after installation septic system service. We do septic system maintenance, problem solving, certified full system inspection, system locating, and small repairs. We do all this while providing you with excellent education on your system, superior customer service through our three step system. 1. Know your system! - We can asses all aspects of your septic system to help you understand what you have on your property. 2. Regular maintenance! - We will set up a maintenance program that is tailored to you and your system. Your personalized maintence program will help ensure you get longevity from your system and that you are doing everything you can to protect your land, water and investment. 3. Emergency plan! - If ever a problem arises, we will be there ready to get everything back on track! 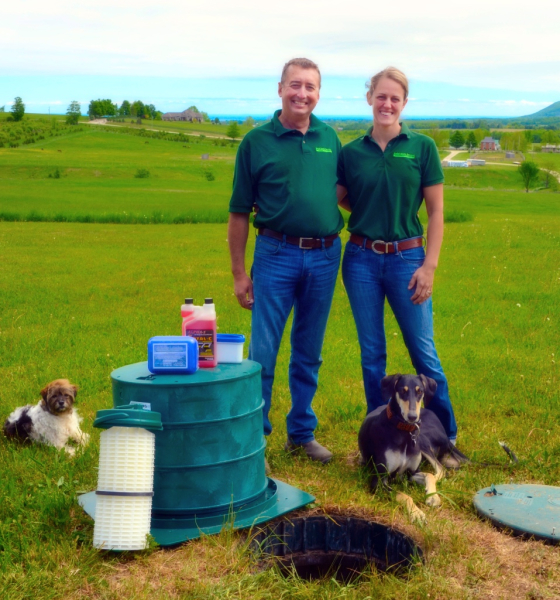 Ardiel Septic Services is owned and operated by husband and wife team Giles and Katrina Ardiel. This company has been operating in Georgain Bay area, in the Ardiel family since 1975. Owend first by Giles' cousin and then by his brother before him. Giles grew up in a large family and was expected to work long hours on the family farm. Growing up on the farm hard work was expected and rarely given credit or gratitude for. This is why Giles enjoys working with his customers and providing them with an excellent service. He enjoys the gratitude he receives from a job well done. Katrina Ardiel grew up with expectations of a caregiver. whether it was for her siblings, or her grandmother, friends or animals she was always giving someone attention and care. This is why she enjoys caring for her customers today. She enjoys taking the time to teach them about their system and answering any questions they might have. We take great pride in supporting our customers with the fastest, friendliest service in the area. Over the years, Ardiel Septic Services has grown to meet the requirements and regulations of the constantly evolving waste water industry. Today, our company is ready with all the tools and skill required to help protect your health and the environment.